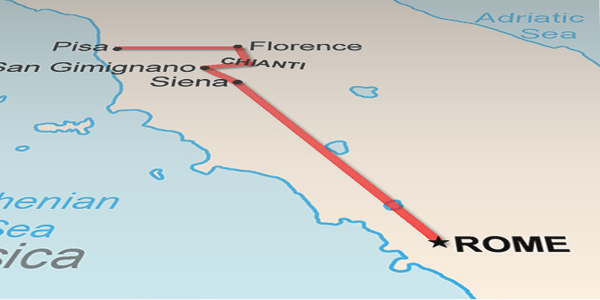 • Short breaks (2–4 days)It's folly to try and cram Italy into a single week. Trust me. I've spent approximately six years of my life there, and have yet to scratch the surface (and three of those years—spread out over 15 years—were spent writing guidebooks and being, for all intents and purposes, a professional tourist). Doesn't mean we can't try! We can have a great time trying to cram in as much as possible, and here are some perfect itineraries that so just that. Please take a moment to read the "How these itineraries work" page so you can get the most out of each sample vacation blueprint. If you prefer someone else to sweat the logistics details, take care of the driving (or train tickets), and provide a professional guide for all the sightseeing, consider an escorted tour. Not just any tour, mind you, but one that allows you a measure of the kind of freedom independent travel offers. Here are a few of my favorite tour companies who emphasize just that. You'll notice that most of the tours affered by the companies above are mostly small, limited to 12 people (at most 16). In the case of the Select Italy packages, they're essentially private tours including lodging, guided walks and side trips each day, and often most of the transport from place to place. No giant lumbering buses here. You travel on local trains, city buses, ferries, and the occasional private car or minivan. Airfare is not included—though most of these companies can arrange it, often at discounted rates—leaving you free to find the cheapest fares on your own. Also, none of these tours are "all-inclusive"—and that is a very, very good thing. Most of the classic, "all-inclusive" tours out there offer the lowest common denominator of travel experiences, traveling firmly in the deepest ruts of the established tourist routes. Instead, these low-priced guided trips come with plenty of options to customize your days and your vacation can remain your own—only with the benefits of a professional guide. With this kind of tour, some of the sightseeing admissions are included but some are not. That way you can pursue the activities that appeal most to you. Some in the group can hit the local museum, others go shopping, and others simply wander the medeival streets and maybe get a cappucino at a cafe. Same goes for dining. I can think of nothing more depressing than being forced to eat all ogether at every meal (which entails diners only at touristy restaurants able and willing to accommodate large tour groups). Instead, with these tours you usually get most breakfasts, perhaps a special lunch or dinner or two (at an agriturismo restaurant, or a group picnic in a spectacular setting), but are otherwise left to find your own wondeful trattorie and osteria (though the guide can always provide recommendations).